Late Dec. 20, the U.S. House of Representatives approved the $633 billion National Defense Authorization Act for 2013 in a 315-107 vote. The version must now be approved by the Senate. The U.S. EPA has finalized changes to Clean Air Act standards for boilers and certain incinerators, which it reported will lessen particle control requirements for biomass units and lower compliance costs. 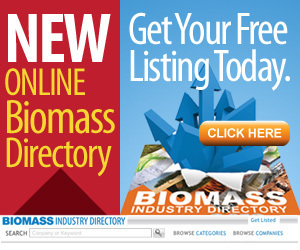 The Biomass Thermal Energy Council has named its Biomass Thermal Champion of 2012, and the award goes to Sen. Jeanne Shaheen, D-N.H., for her leadership on advocating for the inclusion and parity of biomass thermal energy in federal programs. The City of Ottawa has signed an agreement with Plasco Energy Group Inc. to supply 109,500 metric tons of municipal solid waste per year to the company for use in a waste conversion facility. Plasco will begin construction on the facility in 2013. Under contract with the National Renewable Energy Laboratory, Harris Group has completed a comprehensive review of biomass gasifier technologies, titled "Biomass Gasification Technology Assessment." The fiscal year 2013 National Defense Authorization Act is one step closer to becoming law. The Armed Services Committees of the U.S. House of Representatives and U.S. Senate announced completion of conference reports for the legislation Dec. 18. The U.K. Department of Energy & Climate Change has announced a 400 MW non-legislative cap on the total new build dedicated biomass generating capacity that can expect to be supported at 1.5 Renewable Obligation Certificates per MWh. On Dec. 17, the U.S. Court of Appeals for the District of Columbia Circuit dismissed a lawsuit filed by the American Petroleum Institute against the U.S. EPA challenging the 2011 cellulosic requirements of renewable fuels standard. Oregon Gov. John Kitzhaber believes energy is the issue of our time, and to address the issue, he has released a 10-year Energy Action Plan. The 48-page plan includes a recommendation section on bioenergy and biomass-based thermal energy development. The Sequoia Foundation has released an independent health impact assessment (HIA) for the proposed 2 MW Cabin Creek Biomass Energy Facility near Lake Tahoe, Calif. The county will consider the plant's minor use permit on Dec. 20. With new funding in hand, Proterro Inc. is poised to take its sucrose-producing process to the pilot stage, using full scale-bioreactors. The company expects the process can produce fermentation-ready sugar at a cost of less than 5 cents per pound. Drax Biomass International Inc. a development and operating company focused on manufacturing wood pellets for renewable, low-carbon power generation from sustainable biomass, has announced its plans for three projects in the Gulf region.